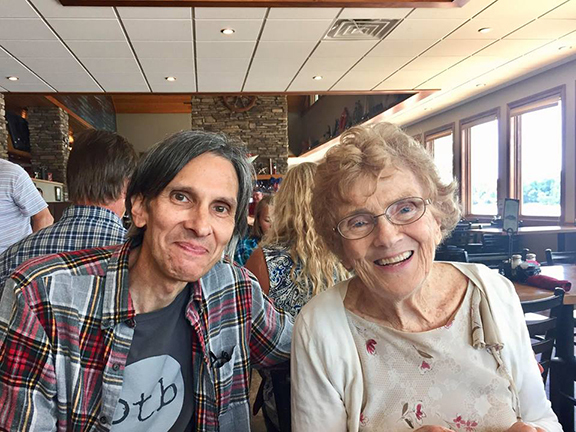 On Father’s Day the Mitchell crew converged on the tiny town of Naples, Illinois to celebrate Mom’s 82nd birthday as well as Dad’s abiding spirit. We arrived in a well-buffed Lexus, a “half-broke” Durango, and all other manner of transport, save for watercraft, which would have befit our destination, Evandy’s Boatel, the perfect place to commemorate our family’s special occasions. While others were in fact arriving by boat, we took our seats at a long table overlooking the river. Being keen barge-spotters, the youngsters among us ran to the window when one of the freight-bearing vessels plied the muddy waters. Meanwhile we seasoned aficionados contented ourselves peering over the shoulders of the kids, while remaining seated sipping iced-tea (in Mom’s case) and AmberBock (in mine), until the catfish and hushpuppies arrived. All the while my mom was in her element, surrounded by family – sons, daughters, grandsons, granddaughters…and Anna (Pevey), my right-hand-girl at the bookstore, and also Mom’s extra-special new friend. So off we went to the town in which my father was raised, the town made famous by my friend, Bob Merris, in his book, Naples on the Illinois: Of the River, On the River, and Sometimes…In the River. Funny thing, the last time Dad enjoyed a celebratory meal at the Boatel was two summers ago. And sure enough the river was rising at a threatening rate. We had to park this side of the levee, where a young man in a golf cart drove those who needed it to the foot of the outside stairwell. Dad certainly needed it that day, this man who had always eschewed a cart on the golf course. He never understood why anyone would need to drive from shot to shot. They closed the restaurant for business the very next day. So I was thankful we were able to break bread one more time before the levee broke. But this past Father’s Day, Mom’s birthday, the river was not a menace. It was a playground for boaters and skiers, and sun-seekers on a perfect summer day. It was also the stage-like backdrop to our luncheon in Mom’s honor. And she gloried matriarchal. For she was in her element, surrounded by family, the only thing that has really ever mattered to her. One of us said it felt wrong to be there without Dad. But Mom reassured all of us that he was there. And not in some overtly religious or hooey mystical way. But in all the old stories each of the grownups told, and in each stone all the carefree kids skimmed across the surface of the fabled Illinois.